Pay per click (PPC) is an internet advertising tool used on websites in which advertisers pay their host only when their ad is clicked upon. With Search Engines, advertisers typically bid on keyword phrases relevant to their target market. Content sites commonly charge a fixed price per click rather than use a bidding system. A PPC campaign costs you every time someone clicks on your link. Do you know if your PPC clicks are producing the leads you want? Are you doing A/B testing for your PPC campaigns? Online visitors find what they are looking for via search engines. In order to be found, a website requires a high Search Engine Results Position (SERP). This means when someone searches keywords or phrases, they should find your website on the first page of the search engine results. PPC advertising gives you an opportunity to list your company on the first few pages on search engines under the sponsored link section. aMarketForce’s talented and experienced PPC campaign management team creates and manages your PPC accounts. We create PPC ad messaging and set bids, monitor results and make necessary changes to ensure you have a secure position high on the search engine result pages. All this high quality and detailed work is performed at low costs, but deliver great marketing ROI. Email us your website for a FREE analysis at info@amarketforce.com. 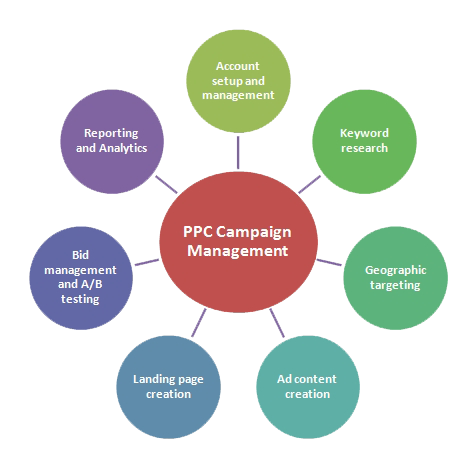 We will get back to you with a detailed analysis on your keywords for PPC campaign management. Request a Quote for Pay-Per-Click PPC campaign management services.